The Quality Systems Assessment (QSA) is a clinical risk management program designed to provide clinicians and managers at all levels with information relevant to their local systems for clinical quality and patient safety. The QSA is one vehicle that contributes to resilience in our health system. Working directly with local teams and local priorities, the QSA supports continuous learning and improvement to prevent and reduce patient harm. All effort that local teams invest in the QSA process is valuable evidence to contribute to local accreditation against the National Safety and Quality Health Service Standards. The QSA helps to identify clinical risks and provide clinicians and managers at all levels with information relevant to their local systems for clinical quality and patient safety. All Organisations (Local Health Districts + Specialty Health Networks + Ambulance Service of NSW) participate as a proactive commitment to continuous local and system-level learning and improvement. The QSA is an important part of the NSW Patient Safety and Clinical Quality Program (PSCQP). Established in 2007, the QSA is the first of its kind in Australia to create an annual system-wide self-assessment focus and census on common topics of clinical risk. The shared focus enables identification of local and system risks to improve, as well as highlighting and sharing examples of excellence and strength. Onsite visits that validate the self-assessment responses and facilitate discussion and collaboration on local priorities for improvement. Experience gained from working with local teams over 6 annual cycles has evolved the QSA to that there is a far greater focus on continuous learning and improvement through collaboration within and between teams. The QSA program focuses on the systems for quality and safety and not on individual performance. 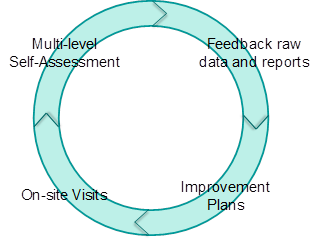 The QSA methodology is based on a risk management framework (self-assessment and follow-up site visits) that evaluates the systems and processes organisations have in place to control patient safety risks.